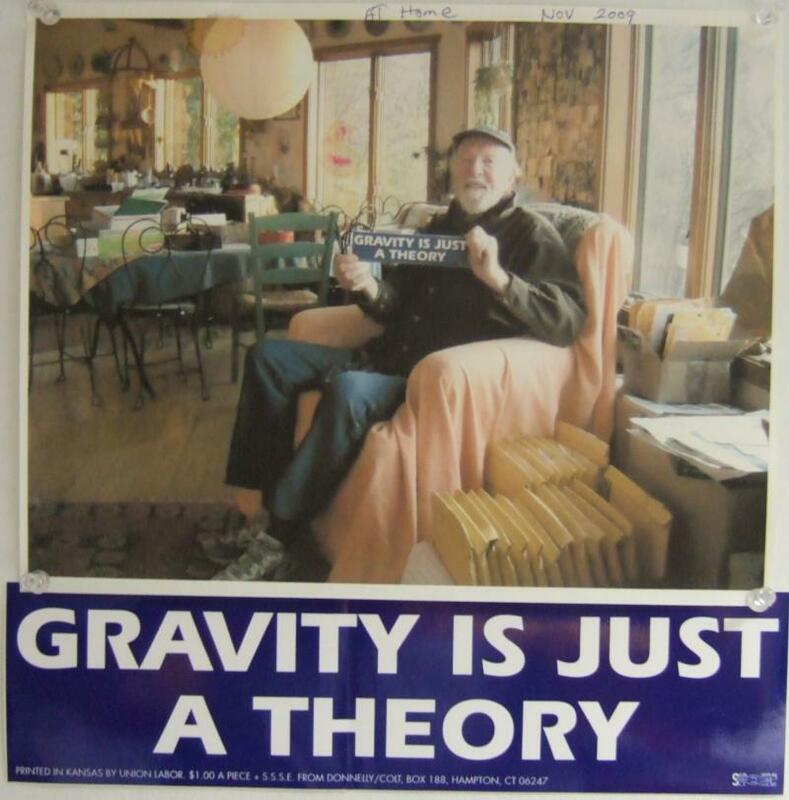 In a phone conversation with me, Mr. Seeger commented on how he had these b-stickers made when he heard about Kansas’ trouble with evolution challenges to our science standards in 1999. He had heard about the creationist mantra that evolution was just a theory, thus the selection of the saying for the bumper sticker. He shared how he used to give them away at his concerts explaining how everyone needed to support strong science. Seeger drove an electric car, and charged it from his own solar system. According to the folksy Home Power magazine, in 1991 Seeger was intrigued by Ed Witkin’s battery powered 1969 VW Microbus, which was used to provide electricity for one of the Clearwater stages. Pete wanted his own electric vehicle, and Witkin helped him find a 1988 Ford Ranger, with both four-wheel drive to handle his mountain and a 26.4-kilowatt-hour bank of lead-acid batteries connected to a nine-inch Advanced DC motor. “The real revolution will come when people realise the danger we’re in,” he offers in parting. “I’m not as optimistic as people think I am. I think we have a 50-50 chance of there being a human race in 100 years”.